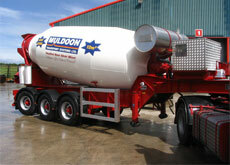 About Muldoon Transport Systems Ltd.
Muldoon Transport Systems Ltd is a family run business that have been successfully designing and manufacturing specialist trailers and equipment for the road transport industry for over 30 years. Focusing on innovative products to meet the demanding and competitive needs of todays transport industry, Muldoon Transport Systems Ltd have invested heavily in design engineering and built and enviable reputation for designing and manufacturing innovative, high quality products for specialist transport operations. We work closely with the industry and our customers to design and manufacture products that will give them a competitive edge and ensure unrivalled efficiency, operation and safety. From humble beginnings working out of his Grandfather’s blacksmiths shed, Gerald Muldoon kept the family engineering tradition alive and the company now operates from two adjoining sites, a large purpose built modern factory catering for new build work and an adjoining site to cater for parts, repairs and servicing. We also have a well equipped Precision Engineering facility where our highly skilled machine engineers manufacture the majority of our components in house and a dedicated Ressearch and Development and design department. Our parts department stocks all parts for its trailers and equipment and a next day delivery and van delivery service is available. Our extensive resources and facilities puts us ahead of our competition in providing us with the ability to be one of the few trailer manufacturers who can complete our build work from start to finish under one roof. This means we are in complete control over design, build quality and production and are not relying on inferior, mass produced components from overseas. And because we are low volume, bespoke production, each build stage of the trailer will receive unrivalled care and attention from our skilled and experienced engineers, many of whom have been with us for over twenty years. 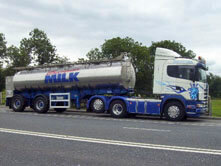 We are the market leaders for Bulk Blowing Vehicles and and our extensive product range also includes Blowing Skelly Trailers for the plastics and sugar industry, Body Builder Chassis’, Alloy Bodies, Drag Trailers and Cement Powder Tankers. We also specialise in general trailers incorporating a rear steer system including Tippers, Curtainsiders, Flat Bed Trailers, Block Trailers, Cement Mixer Trailers, Double Deck Trailers and basically any trailer that can benefit from incorporating Muldoon steer technology. 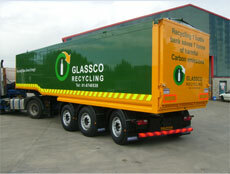 We were also at the forefront of the campaign to allow longer vehicles on UK roads and were the first company to receive special permission to trial the longer vehicle on the roads in the UK. 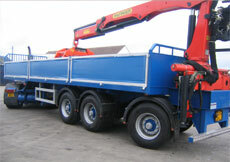 The innovative trailer met all the legal build and turning circle requirements by using Muldoon steer technology. Our markets include Ireland, UK, Europe and South Africa and this is growing as people discover the benefits and advantages of our specialised trailers and applications, especially the steer system. 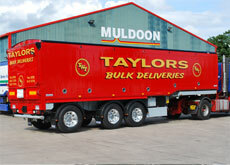 Muldoon Transport Systems have been providing 30 uninterrupted years of dedicated and professional service to our customers and with our continuous commitment to innovation, quality and customer requirements we intend to continue being at the forefront of cutting edge transport and trailer technology for many more years to come.